The Charter for an Authentic Barbet has been revamped to be more easily legible and the history and our reason for being included. 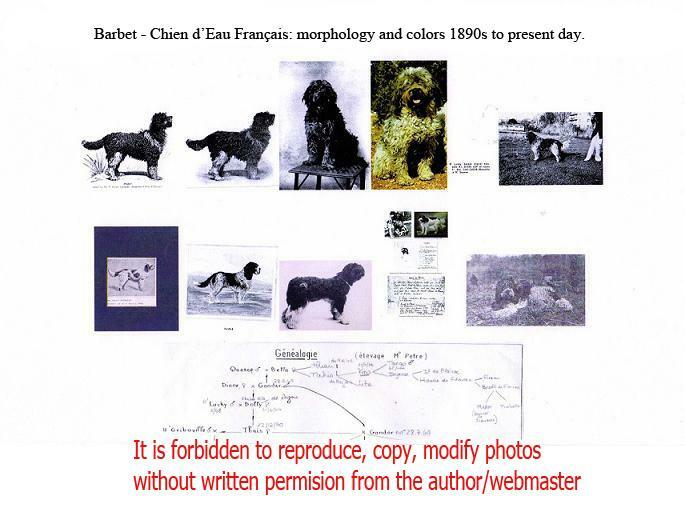 “The Barbet is not a spaniel, but a Griffon whose origins have been very much a topic of discussion...written in 1933, by M Dhers for the Chasseur Français. 3.	a breed of its own. Those of us who have signed the BREEDERS’ CHARTER for the AUTHENTIC BARBET believe in the 1894 standard written for a Griffon Barbet. We believe that a Griffon is not a Poodle. The poodle is a sophisticated, elegant dog with its own standard. Yes, it is a descendant of the Barbet, but selected for another purpose: refinement and elegance. The Barbet is a Griffon that was transferred into the SCC group 8 because of its remarkable ability to swim. It is and must remain a rustic, all around dog, that can retrieve from water and hunt on land, when trained. The Barbet also excels in agility and is a very intelligent dog who learns very quiclky. As a revamped logo will be posted on our sites, we would like to stress our will to continue the phenotype/ appearance of the Barbet from the 30’s, as documented in many books and photographs. strive towards the morphology, natural( retrieving and hunting) ability, character, health, the multitude of colors that make the Barbet special, and a rustic, sound animal as there were documented to be at the turn of the 20th century and throughout most of the 20th century before some radical changes were made to the breed and its appearance and to the standard. As a reminder ,back in “those days” ther was no DNA( a medical test to confirm parentage by using saliva or blood), but when you looked at the dogs, you knew where they were bred and what breed they were. 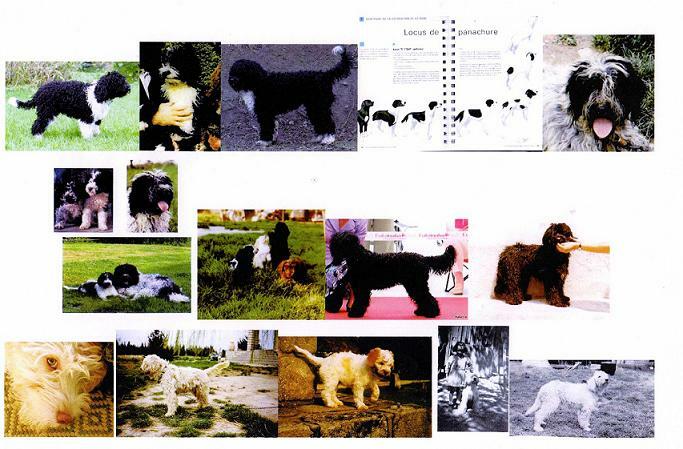 The Barbets, not SCC registered, had the appearance of a purebred dog and were admitted to the Titre Initial registry after having been seen by a judge of the SCC. Their origins can be traced through ownership. 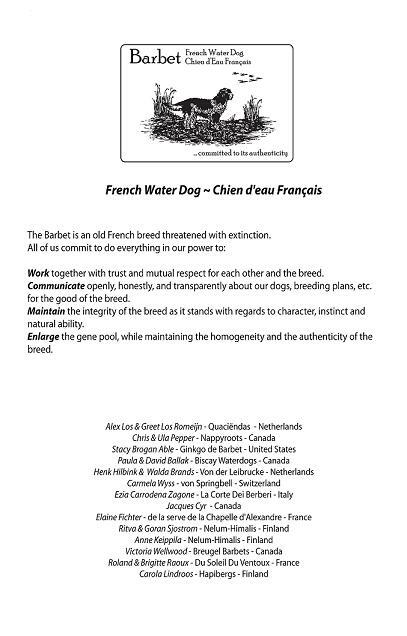 We would like to put our competencies at the disposal of those who share our values and are interested in joining our community, working towards our target which is the survival of this wonderful French breed, please feel free to contact any of us. 46cms/ 20kgs/coat white with black, wooly. Records were kept on all the dogs as far as morphology( positive and negative points), colors, measurements, ability to hunt and character. M Le Houelleur had sold his last barbet and stopped breeding in 1941, Dr Vincenti had died.In the North of France, the numerous Barbets were just about exterminated after the war. Just about doesn’t mean completely as it was known that there were still a few Barbets, mainly in the south of France. No one, unfortunately has ever looked into what stock could be left in the north of France, Belgium or the Netherlands as it is a tidious and time-consuming task. No one can say either or prouve that the breed was extinct unless one has turned over every stone in the countries where there were Barbets starting at the beginning of the 20th century who most likely reproduced at some point. As far as the Barbet was concerned, breeding went forward for a few years with the Ayme brothers, who lived in the mas( Mas de la Musique), next to the Vincenti family’s Mas de la Chapelle. They were far away from paris and the SCC, and didn’t feel concerned with dog shows or beauty, the Barbet was a working hunter and that was their reason for being. Eventually, new blood had to be found as they were confronted to the inbreeding problem one has with not enough different blood. Thanks to Quesop ( Portuguse water dog) brought back from Portugal, in a truck full of bulls! and mated to Bella, breeding was continued. And a long line of descendants was started. Some successful, some less as is the case with most breeders. Mrs Pêtre was helped in her endeavour by several willing people until the early 80’s, when. M Hermans had decided to re-incarnate the Buffon Barbet from 1776, by crossing T.I. 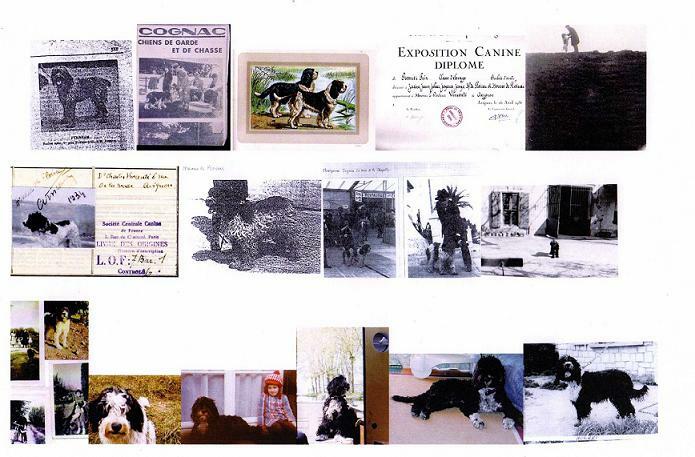 dogs found in pounds with poodles and more poodles and discarding all of the Griffon Barbets in the south of France along with their breeders, descendants of Dr Vincenti and M Le Houelleur’s Barbets from the 30’s. The Barbet war had began and is ongoing to this date, 30 years later. This document cannot be used, reproduced, modified or copied, even partially, without EXPRESS WRITTEN consent of the owner.